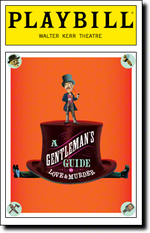 Tony Award winner Jefferson Mays (I Am My Own Wife) plays eight roles in this frisky musical romp set in Edwardian England about a line of heirs, family money — and homicide. When Monty Navarro finds out he is eighth in line to inherit a dukedom, he decides to eliminate the other seven heirs standing in his way — all played by one incredible actor. This witty music-hall comedy explores how low we'll go to make it to the top. This is a really fun farcical musical. The performances are solid across the board and the physical comedy is superb. Big shout out the director for some very creative staging.